Author Damian Mogavero discusses his book about the intersection of technology and food. It has never been a more exciting time to be a foodie — nor a more challenging time to be a restaurateur. Diners are enjoying the latest food trends, whether it is farm-to-table cuisines, craft beers, food halls or ordering from UberEATS. But for restaurateurs, the pressure to keep up can be daunting. Damian Mogavero put chefs together with techies to create a restaurant analytics software company that helps restaurants run more efficiently. His clients include Gordon Ramsay, Guy Fieri, Daniel Boulud, Danny Meyer, Giada De Laurentiis, and others. He wrote a book about the restaurant industry’s ‘new guard’ – those who embrace data analytics as they adapt to new trends. They’re radically different from traditional restaurateurs who run their eateries largely on gut instinct. 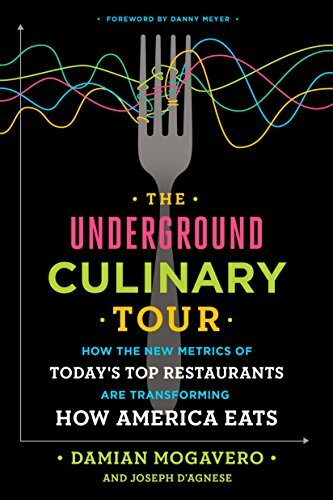 Mogavero talked about his book, The Underground Culinary Tour: How the New Metrics of Today’s Top Restaurants Are Transforming How America Eats, on the Knowledge@Wharton Show on SiriusXM’s channel 111. Knowledge@Wharton: Give us a little background as to why analytics was a hard adoption by the restaurant industry. Damian Mogavero: The restaurant industry is a very artistic and creative industry. It’s something that has always been a little bit slow to embrace technology in the past, but that really is all changing. 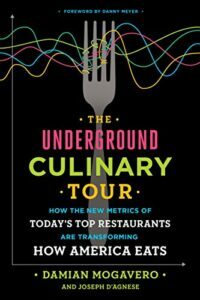 The Underground Culinary Tour is really the backstory of how the experience has been transformed by two big things. One is technology and the second is the adaptation of trends from the foodie generation. Restaurateurs who get these two things, I call them ‘new guard restaurateurs.’ The book actually reveals the magic behind the scenes. Knowledge@Wharton: Why is it so important for these companies to have this technology? Mogavero: Look, it’s like ‘Moneyball’ [a book about how analytics transformed a baseball team’s performance] for restaurants. Just as in a baseball card you have things like runs batted in and base percentage, a server’s scorecard shows how often a server is selling appetizers — it’s called items per cover — or bottles of wine. This enables the restaurants to focus on key areas to train their staff and really concentrate on certain menu items. That provides revenue and a more consistent guest experience. Knowledge@Wharton: You relay an interesting story about a gentleman you talked to at Harrah’s Entertainment, [now Caesars Entertainment Corp.] He’s somebody who wasn’t an MBA, but he had this massive job that he was taking on. … The analytics are important, but it ended up being that personal touch with one of his servers that made the difference in how successful she was. Mogavero: The executives looked at the baseball card for this server. It turned out that this server sold significantly less wine by the bottle than her peers. When the manager approached the server, it turned out the server actually was afraid of opening up a bottle of wine. That was a revelation. Because of the data, they were able to pinpoint the training — the steps of opening a bottle of wine. As a result, on the very next shift, wine sales increased fairly exponentially. Not only did the server make more money, the restaurant made more money and the guests got a better experience. Knowledge@Wharton: The restaurant industry is something where the margins are fairly tight to begin with, so restaurants have to think about anything that helps them maximize their profit. Mogavero: I couldn’t agree with you more. If you look at most industries out there, they’re looking at each of their products and their margins and all the rest. But it’s really historically been difficult to get access to the data. If you have a restaurant that is serving breakfast and lunch, people want orange juice or coffee. What is seen in the data is that if people are ordering coffee and orange juice most of the time, but you have one server who’s only [performing] 10% of the time, then all you need is to see it in the data and you’re able to really get $10,000 more just by identifying that one server is at 10% item per cover and the others are at 80%. Knowledge@Wharton: You’ve been a fan of the restaurant industry for quite some time. Bringing software like this to the restaurant industry was probably a natural path for you. Mogavero: It was. I fell in love with the hospitality industry as a teenager in Cherry Hill, N.J. I was a busboy and learned important lessons. My general managers just needed to exceed guests’ expectations. That was my initial love for hospitality, but I also love numbers. I got a finance degree, went to work on Wall Street, went to Harvard Business School, then got back into restaurants. I would ask chefs and managers, “Who are your top servers? Why did your food cost go up? Why did your labor cost go up?” They basically had blank stares and wrong answers. These are fundamental business questions for profitability. What I did was put together a team of technologists and restaurateurs to create Avero. I started from my studio apartment and with a great team. We built it to 10,000 restaurants in 70 countries. Knowledge@Wharton: This was a bringing together of code writers, chefs and restaurateurs to try to understand what software was needed. Mogavero: It’s a funny story because when I recruited a chef, a sommelier, a restaurant manager and these three techies, the techies said to me, “Why would you ever hire restaurant people? They don’t know anything about building code.” And the restaurateur said to me, “Why’d you hire these geeks? What do they know about restaurants?” And I just said, “Restaurateurs, please be nice to the techies. And techies, please don’t build anything without consulting and getting the input of restaurants, otherwise the software won’t be easy to us.” The funny thing that happened is that the restaurateurs became computer savvy, and my techies started eating foie gras and drinking nice wine. And that became the culture of the company. Knowledge@Wharton: With the level of innovation that is in the industry right now, what are some of the things restaurant-goers may not see that is making the experience different? Mogavero: I think there’s never been a more exciting time to be a consumer in this space. If you’re a foodie, it is just incredible because you can get great food everywhere. You now can even get great food at Terminal C at Newark Airport. You can get a lobster roll in the middle of Manhattan. You can even go on your smartphone and get food on demand. When you think about it, the highest quality ingredients in the most casual setting is a real big trend that we see throughout the country. It’s an exciting time to be a restaurateur, but it also can be a challenging one. Competition is high, food costs, labor costs are high. The role of technology is absolutely critical to optimize each of those guest experiences so that you can be profitable and the guests want to come back to the restaurant. Knowledge@Wharton: You mentioned online ordering. How impactful has that become? One of the common themes about restaurants is building that relationship with customers so they will come back. It’s a little different when that person is not in the seat. Mogavero: Yes, it is. So many of our clients at Avero are experimenting with many different delivery services, whether it’s Postmates or UberEats. It’s important to recognize that there’ll be some of your guests whose experience is really based upon the experience from their phone and the delivery experience. Also, not all menu items deliver well. There has been some adaptation in the menus and even packaging to realize that this is a different guest experience that’s happening. Knowledge@Wharton: You talk in the book about theft and fraud within this industry and how that is important. There was a report done by the Tampa Bay Times about places that were saying they were farm-to-table and weren’t. Mogavero: I have a chapter called “Under The Table.” Like the movie ‘Catch Me If You Can’starring Leonardo DiCaprio whose character was the thief and always three steps ahead of Tom Hanks’ character, the FBI agent. Many businesses have a few bad apples. The restaurant business is no exception. Instead of Tom Hanks, we developed an algorithm to find micro-theft. Unlike a human, an algorithm can comb through hundreds of thousands of transactions in seconds to find transactional fraud. I’ll give you an example. I went to lunch with a colleague, and the algorithm guided me to a specific server. We had a great lunch and paid for lunch, which included a Diet Pepsi. After the fact, we discovered the server voided out the Diet Pepsi and applied a mysterious discount that amounted to about $6. Guess who ended up getting the $6? The server. One may say, well, it’s $6. But if you look at the data, that amounted to $5,000 a year. Knowledge@Wharton: What has to be done to eliminate this? Mogavero: Just like in the movie, thieves innovate. There are a lot of people who get smart and are stealing differently. Micro-theft is a big trend, and that’s why technology plays such an important role. This product that we developed, called Avero Loss Prevention, combs through all of the data and helps identify this quickly. Knowledge@Wharton: Where did the name of the book come from? Mogavero: The Underground Culinary Tour gets its name because I host, along with [New York-based restaurant consultant and search executive] Alice Elliot, a tour. Essentially, it uses New York City as a restaurant laboratory to help restaurant leaders see a glimpse of the future of how people are going to eat. Trends that used to take 15 years to 20 years to get to the rest of the country, we now see taking six months to 12 months because of social media and technology. Things are moving so much faster. The tour is 15 stops in 25 hours, and it’s really to help restaurant leaders adapt to this next generation of foodies. Knowledge@Wharton: How has that impacted the industry in general and specifically for portions of the U.S. that may not see these changes as fast? Mogavero: In Chapter 10, which is “Restaurants of Tomorrow,” there’s a concept that I discuss called urban disloyalty. When you open a restaurant, especially in an urban market, because of social media and food blogs that highlight these new openings, foodies are temped to go and try these new places. While that’s very exciting for the consumer, that means that perhaps the consumer is going to a new place at the expense of an incumbent place. That’s why we see on these new guard restaurateurs, they’re constantly innovative in ingredients, beverage and space and the X factor. When they do that, it really gives people a reason to come back. You can see it in the data as well. Knowledge@Wharton: You talk a lot about the beverage industry. Are you expecting to see more craft beer locations continue to pop up? Mogavero: One of the big trends that I see is that beverage is at the forefront, not an afterthought. In the old days, restaurateurs would open up a restaurant. A few weeks before opening, they would call the beverage center to get their selections. But today a beverage professional and the chef and the owner work together from the moment the concept is created because the beverage is a differentiator, and many times it really is a reason why people go. I always say if you want to find great food, go to a place that has a thoughtful beverage program because they’re the ones that you know they got the food right. But the opposite isn’t always true. Knowledge@Wharton: Some of the people that you have on these tours are executives from big restaurant chains. What do they come away with from doing something like this? Mogavero: One of the trends that I see is the food halls. I believe that food will be a major real estate anchor tenant for major real estate projects. On the tour, we highlighted a concept called Gotham West Market. One of the guests of the tour actually went back to his own market in Texas and is building a 55,000-square-foot food hall based upon what he learned on the tour. Toyota’s moving their North American manufacturing facility there. Food is a major component, which includes this 55,000-square-foot facility, 20 different artisanal vendors, brewery and live music. Knowledge@Wharton: We talk about the food industry in the United States, but there is so much to be garnered and learned from places around the world — the traditions, the food styles and the flavors. Mogavero: Yeah, I think that the farm-to-table movement is now being applied to pretty much every major ethnic cuisine. Again, I don’t think there’s ever been a better time to be a foodie. Knowledge@Wharton: Are you at a point where it’s almost an open door because so many out there are looking now to incorporate analytics, compared with a decade ago? Mogavero: People are much more open to data because the software is very simple to use. But I also think people realize the pressures with competition and prime costs — your food, beverage and labor costs — so you really need to find a way to use the data for better scheduling, for better procurement, and really understanding your trends is critical. Knowledge@Wharton: There is also the push in many cities for $15 an hour as minimum wage. Mogavero: Nineteen states are raising their minimum wage in 2017. Just think about that. Labor costs are going up. How do you deploy this more expensive resource? You really need to understand and use technology as a competitive advantage to make sure you’re scheduling people at the right time. By aggregating all this data and really understanding the demand patterns, you’re able to schedule the labor when you need it. And that’s going to help you drive revenue. But at the same token, you’re going to be able to schedule labor when it’s not as busy, but it’s going to be more dynamic.